As one of the world's most prestigious brands, Ferrari is regarded by many young boys as the ultimate in style and luxury. 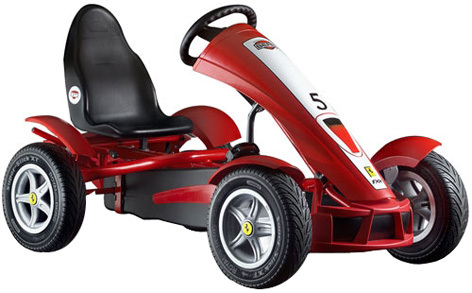 Although owning a 'real-life' Ferrari is out of reach for most people, there is an ever-popular and ever-changing variety of Ferrari toy cars, models and ride-on go-karts that can bring this legendary Italian brand into the homes of many young dreamers. Although they will still set you back a pretty penny, Ferrari toys start small with some stunning pull-along wooden cars. These are beautifully finished in the famous 'racing red' colour that Enzo Ferrari loved so much - and each one possesses an immaculate quality of finish. Mid-range Ferrari toy cars consist largely of die-cast collectable models that come in a plethora of sizes, finishes and quality. Ferrari lovers can find models of everything from the first road Ferrari (the 125 S) right up to the latest concept, hybrid cars. At the top of the scale you'll find some Ferrari ride-on go-karts that have to be seen to be believed. The Ferrari FXX Racers Pedal Go-Kart is inspired by the car of the same name and can be driven by children over the age of 5. The super-slick 'X-treme' tyres, in-built electronic lap times system, seven gears and two rear-disk brakes go some way to justifying the recommended price-tag of around £2000. Ferrari battery operated cars by Famosa are as luxurious as you can buy in a toy. The fantastic Ferrari FF model has a superb paint finish, forward and reverse gears, a proper foot throttle pedal and electrically operated brakes. The range also has Ferrari trikes, ride-on cars and a stunning replica California model with two seats.